During this week of the 3rd anniversary of Storm Desmond, we asked Marc Pinnell, Managing Director, about his thoughts on how Storm Desmond affected the UK and the flood risk industry. Storm Desmond was the 4th named storm of the 2015 – 16 United Kingdom and Ireland windstorm season. Concentrated around the 5 December but extending to the 15 December, Desmond brought record amounts of rainfall and subsequent major flooding. In the UK the worst affected areas were Cumbria, Lancashire and the Scottish borders but severe rain and flooding was also experienced in Northumberland, north Wales and Yorkshire. In Ireland the Shannon River Basin and Irish midlands were affected. 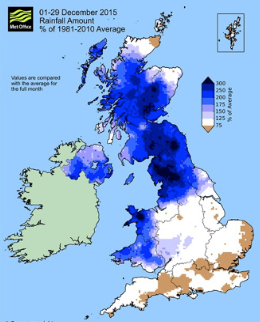 Desmond broke the UK 24-hour rainfall record recording 341.4mm at Honister Pass, Cumbria on the 5 December 2015. Arguably, Desmond also broke the UK’s confidence in its ability to resist and defend against major flooding. Government’s flood defence strategies were called into question with suggestions being made that conventional approaches to flood defence encouraged land use and land management decisions that can make flooding worse. Severe disruption including blocked roads, collapsed bridges, homes evacuated and chaos across rail and air travel was experienced. Many houses were flooded and tens of thousands of properties were left without power as substation flooding and wind damage wreaked havoc. Perhaps inevitably Desmond broke careers too and the Chairman of the UK’s Environment Agency, the body responsible for flood defences in England, resigned in early 2016. However, amidst the destruction Desmond was also a harbinger of new approaches to living with flooding. New terms such as ‘flood resilience’, ‘natural flood management’ and ‘working with natural processes’ were coined or became common place – replacing antiquated terms and approaches such as ‘flood defence’. At least that’s the hope. During this week, we will reflect on the events of 2015 and consider how far we have come – and perhaps how far we still have to go to become truly resilient to the impacts of flooding and a changing climate. Email Marc Pinnell or visit our flood and water management web pages for more information.